This is the most common shoe-style on archaeological record for Pre-elizabethan Tudor England. However it is much ignored as paintings show mostly rich peoples shoes. If you are not a nobleman, this is what you ought to be wearing. These shoes were still produced in medieval turn-shoe construction although the better shoes were by then made in welted construction. It has a 3.5mm (1/7in) thick sole and a thong fastening across the instep. It is tough but not quite as hardwearing as our hand-stitched shoes and a good starter model. This is the ladies version of the same shoe-style above. It fastens with a buckle on the side. It has a 3.5mm (1/7in) thick sole and ties. It is tough but not quite as hardwearing as our hand-stitched shoes and a good starter model. Sorry, we do not yet stock a fully bespoke Range for these shoes. You are welcome to register your interest with us now and we will contact you when such shoes become available. Heel Cushions (Price GBP 5.00): These are modern leather covered latex wedges that you can wear inside your shoes. 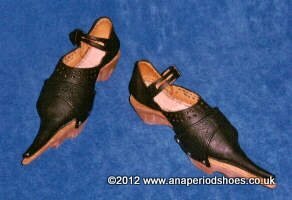 They help to prevent painful heels if you are not used to walking in flat-soled shoes. 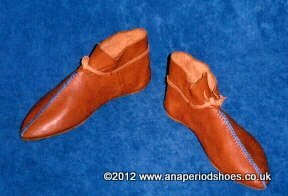 As they are loose you can order as many pairs as you like to wear with other shoes as well. In this case please specify for what shoe-size you are ordering.